I have encountered a lot of young men, a lot of young preachers, who want to model themselves after John Piper. They see his joy in the Lord, they see his passion for God’s glory, they see the fire he brings to his sermons, and they want to be like him. Unfortunately, I have seen more than a few preach with all the passion but none of the unction. They have learned that you can’t preach like Piper unless you know and love God like Piper. You can’t know and love God like Piper unless you first know, love, and treasure God’s Word as he does. He is not first a great preacher, but a man who treasures God through the Word of God. He begins with his own story of being enthralled and held by the Bible. Then, through four chapters, he examines what books and words make up the Christian Scriptures. Three chapters are dedicated to looking at what the Scriptures claim for themselves through the Old Testament, through Jesus, and through the apostles. And then, at last, he is ready to consider the questions that are at the heart of the book, a task that takes four chapters. The final six chapters look at how the Christian Scriptures are confirmed by the peculiar glory of God. It is these final ten chapters that comprise the book’s most notable contribution. Piper’s claim is that the Bible is true, inerrant, authoritative, and the only guide to salvation. But how can we know this? “The Bible assumes there is a basis for firm and justified knowledge that what it teaches is true. It assumes that everyone who hears a faithful narration of the gospel is responsible to believe it—not by leaping into the dark, but by seeing real and compelling grounds for faith. According to Scripture, people don’t have to be educated historians to know the historical truth of Scripture. This is utterly crucial, since the vast majority of the people in the world who will hear the gospel are in no position to comprehend the complexity of the (legitimate!) historical reasoning that supports the resurrection of Jesus and the reliability of the Bible.” Historical arguments are good, but insufficient. “The Bible does not teach or assume that we come to faith by leaping into the dark. It assumes that we embrace Christ and his Scripture by seeing real and compelling grounds for faith.” If you are familiar with Piper’s work, it will not surprise you that he finds his answers by searching the work of his favorite author, Jonathan Edwards, and his central text, 2 Corinthians 4:4–6. He argues that the Bible exposes us to the glory of God and in that way gives us complete confidence that it is, indeed, God’s own word. After recording my own thoughts on the book I turned to the endorsements to see what others have said, and was taken with Fred Sanders’ commendation. “The classic doctrine of Scripture’s self-attestation suffers when it is used as a short-cut method of scoring evidential points or winning an argument without doing any work. But it unfolds its wings and soars to the heavens when handled by somebody who shows that when we read the Bible, we are dealing with God himself in his own holy words. 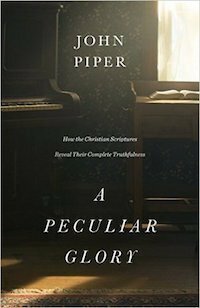 In this book, John Piper throws everything he’s got at the message of how God illuminates the mind and gives firm conviction to the heart through the Bible.” In that way A Peculiar Glory is a logical addition to John Piper’s literary canon and a valuable contribution to Christian publishing. It receives my highest recommendation.